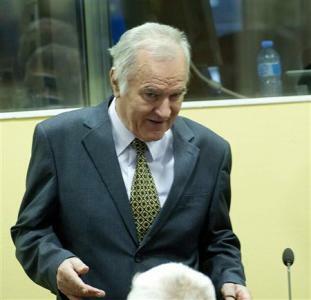 Mladic, now 70, flashed a thumbs-up and clapped his hands as he entered the courtroom in The Hague, where he faces possible life imprisonment for allegedly leading the slaughter of 8,000 unarmed Muslim boys and men in Srebrenica in 1995. In the packed public seating area, a mother of one of the Srebrenica victims whispered "vulture" several times as prosecutors opened their case. Later, Mladic made eye contact with one of the Muslim women in the audience, running a hand across his throat, in a gesture that led Presiding judge Alphons Orie to hold a brief recess and order an end to "inappropriate interactions." Wearing a dark suit and tie, he sat, spectacles in hand, listening intently and jotting notes as prosecutors made their opening remarks.